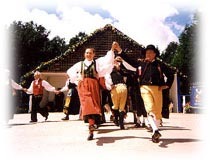 NORDISKA BEGAN when the late Gordon Ekvall Tracie founded Skandia Folkdance Club in 1949 (later named Skandia Folkdance Society), along with an unnamed performance wing. In 1952, Gordon officially named the wing "Nordiska Folkdancers" and designated the group as a separate, sister organization to Skandia. Today, Nordiska's membership includes charter members who have been with Nordiska since 1949, and many who have been with Nordiska more than twenty years (both categories something of a record for performance groups), plus newer, younger members who are discovering the joys of these traditions. To this day, Nordiska has maintained the philosophy and standards with which Gordon Tracie began the group: that Scandinavian music and dance traditions should be preserved and presented as authentically as possible; and that these marvelous expressions of Scandinavian cultures are to be enjoyed! OVER NORDISKA'S 60 YEARS, the group h﻿as perform﻿ed for visiting Swedish, Norwegian and Danish royalty; in concert with illustrious musicians from Scandinavia, such as Gunnar Hahn and Sigbjørn Bernhoft Osa; at special events such as Skandia Midsommarfest, Ethnic Heritage Council's Worldfest, Northwest Folklife Festival, UW's Lucia Fest, Nordic Heritage Museum's Yulefest and Tivoli Festival, Swedish Sesquicentennial programs, Gordon Tracie Music Library events, Vasa Park's Midsommarfest, the Grieg Festival, Sons of Norway, Swedish Club, and Danish community events; as part of SeaFair's "Peer Gynt," Mountaineers' plays, and local orchestra and folk music programs; in community outreach performances at churches, retirement homes, parades (in 1997, Nordiska was named first place winner in Ballard's 17th of May Parade Scandinavian division); and in impromptu performance just for fun!